I like it when an actor blindsides you with a performance you really weren’t expecting. Especially when they’ve been somewhat typecast in previous movies. Sure, you might be able to identify the odd movie they had that was a break from the norm, before they reverted back to their “type”. And actors sure do love playing up to their “type”! I don’t think we’ll be seeing Dwayne Johnson playing a hopeless romantic any time soon… unless his romance is between him and a free weights section at the gym. Conversely, you’ve got someone like Channing Tatum – a guy that’s willing to experiment with his roles, which has led to some startlingly good performances where he doesn’t just dance around the screen… But all of this pales in comparison to a performance from 2012 by one Matthew McConaughey. That film was Killer Joe. His new film promised more of the same: a break from “type”, but did Mud deliver? I must say that Mud came at me from under the radar. I had no hype for it and it honestly wasn’t even pushed very hard in the UK. If I’m honest, I only became aware of it thanks to Keith over at Keith & The Movies putting it as his “most anticipated” movie of 2013. This guaranteed I had to go out and see it when it hit the UK… and it’s now hit. In an extremely limited release! Coming off the back of a disappointing The Place Beyond The Pines, I was eager to see a movie that lived up to my expectations from its protagonists. Well, Mud did at least achieve that… but just didn’t hit all the high notes I was expecting. Mud is the tale of two boys, Ellis (Tye Sheridan) and Neckbone (Jacob Lofland), who are growing up in the river communities of Alabama. Life’s pretty boring, but they love to explore, so they think all their dreams have come true when they find a boat lodged in a tree following a flood – their own private hangout. But the boat’s not entirely unoccupied. It’s here that they encounter the eponymous Mud (Matthew McConaughey) – he’s homeless, but don’t call him a hobo. What unfolds is Mud’s tale of why he is where he is – he’s murdered someone for treating his girlfriend (Reese Witherspoon) in a terrible manner. He’s on the run, and not just from the police, but from the dead guy’s family too… And our two young leads become embroiled in proceedings. Let’s start off with what I really enjoyed about the movie, and that’s the acting. I felt that every actor was really pulling their weight here. A lot of credit has to go to Tye Sheridan for carrying the movie so well on his young shoulders. He really had to run the gamut of emotions in this movie and really captured the frustrations of being at that age – dealing with the confusing Mud situation and dealing with those pesky “love” emotions. Similarly, Jacob Lofland was ably suited to his role too; providing much of the comic relief in the movie. Not that there were laughs galore to be had, but he broke the tension well. But this is Matthew McConaughey‘s movie, yet again. His character, Mud, is a mysterious one. And thankfully it’s one that doesn’t rely on getting his top off (all the time… it does happen though), or smiling at the camera as McConaughey is so accustomed to. I’d argue that his performance here isn’t as startling as that of Killer Joe, or indeed A Time To Kill, but it’s still resoundingly strong. And before I leave this little “acting love-in”… Reese Witherspoon? Who’d have expected her to be doing some genuine acting too!? The other thing I loved about the movie is it all just “fit” into place. It didn’t seem like a movie – it was like the cameras turned up and just captured the everyday lives of its inhabitants as they were. It’s hard to put this into words to accurately convey the feeling I had here, but the cinematography and direction by Jeff Nichols was suitably apt. However, the film isn’t without its problems – crucially in pacing. The movie does drag its heels at several occasions and the film doesn’t need to be over two hours long. Not by any stretch of the imagination. It seems like the constant “fetch quests” that the boys went on carried on for far too long. This gave the impression that the film was somewhat directionless, as you couldn’t really see any plot progression aside from the fact that you wondered what was going to happen to McConaughey‘s character… at some point. All of this changed dramatically in the final 30 minutes, which was choc-full of action and drama. But for me, it was a case of “too little, too late”. The plotting was there, the script was there and the acting was definitely there. It’s just a shame the film became a little too enraptured with itself to really steam along at a brisk enough pace. Don’t get me wrong, I can do slow and lingering, but there’s a limit on this. Unfortunately, Mud went past that point. 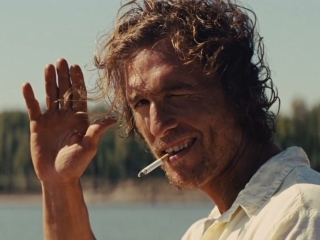 Mud is another star turn for Matthew McConaughey, who’s picked up something of a habit of taking roles you wouldn’t have assigned to him half a decade ago. Whilst I wasn’t as blown away by Mud as I was by Joe in Killer Joe, this can still be classified as a success for him. Similarly, I want to see more from Tye Sheridan in the future. The kid’s got talent and I’m keen to see where he goes next. Unfortunately, the film trips itself up with its rather slow pacing, which makes the second act drag to an alarming degree. So, ultimately, Mud‘s a solid movie, but isn’t one I’d rush out to see again any time soon. This entry was posted in Review and tagged Alabama, drama, homeless, Jacob Lofland, Jeff Nichols, Killer Joe, Matthew McConaughey, murder, Reese Witherspoon, review, thriller, Tye Sheridan. Bookmark the permalink. Good review. This is what happens when you get a talented cast, and allow them to do what they do best: act their asses off. Looking forward to this….excellent review! I love practically everything about this movie. It’s my favorite film of the year so far and I thought it did so much just right.